This is the first restaurant I would suggest for anyone who wants to try original Portuguese food. 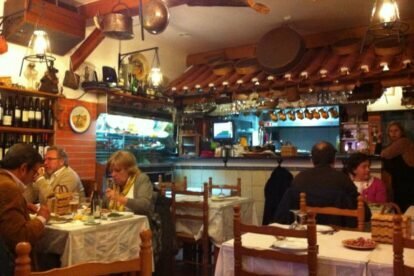 It’s a regional restaurant; most of the food they serve is typical from the biggest Portugal region, Alentejo (which can be translated as “Beyond the Tagus”). I have traveled around Alentejo a lot, and their food is really great. But every time I tried something I have eaten previously in Trempe, I get both disappointed and glad. Disappointed because the original Alentejo local food is not as good as Trempe’s. And glad because Trempe is in Lisbon, so it’s much closer and better! Everything in the restaurant is nice, from the rustic decoration, passing by the tasty food and the great selection of wine. But the most important quality of Trempe is the kind and humorous staff, which are all from the same adorable family. When I go there, my personal and favorite meals are “sopa alentejana” (soup from Alentejo), Dog fish soup, Black Pork fillets, Fried pork with clams and potatoes and for dessert the “Sericaia cake” or the “rice pudim”. I never get tired of any of those. During summer, day or night, I will probably sit at one of the two tables they have outside, where you can have a nice meal facing “Casa Fernando Pessoa“. But whether inside or outside, it’s granted that I always have a great and fun time there.